With the apparent demise of the traditional Derby teams event on the first weekend of October – Solent Wargames Club would like to invite you to Sarisbury Green in Hampshire for a similar style team event. We are close to Southampton Airport for those coming from further afield and may be able to arrange lifts to and from the airport. This will be a 3-player Team event, 1 player in each pool. We already have expressions of interest from Gloucester, MAWS, Oxford, Reigate & Wessex. Individual entries are also welcome provided we can team you up with 2 other players. Please email Pete Dalby at peterdalby1960@gmail.com if you wish to attend by the 31st July so that we can secure the venue. Any list, any date but the following troop types are not permitted – any Armour or Heavy Armour, Pikes, Lances or Elephants. Any list where one or more of these is mandatory may not be used. Any list, any date but armies must field at least 125 AP of Elephants. Elephant mounted Commanders do not count towards this minimum spend. Any list, any date but armies must field at least 450 points of Heavily Armoured Troops. Commanders do not count towards this total. Army Lists must come from the new Book 1 or Book 2. In the absence of a release date for Book 3, the current lists may be used for periods outside those covered by the 2 new books but using V3 points. We will offer 3 games on Saturday and 2 on Sunday. All games to be 3 hours with the exception of round 2 which will be 2 hours 45 mins. Team Entry is £60 per team or £20 per individual. Please contact Pete Dalby at peterdalby1960@gmail.com for information on how to pay. Army lists to Phil Powell at campaignphil@bhgs.org.uk by Friday 21st September. Sounds like fun; I would like to play but need to find a couple of gamer's to make up a team. Great - thanks Paul. I'm sure we can find you 2 more players. I'll keep you posted. Sounds good, let me know if I am required. Excellent news David - well done. So far I believe we have the following - Oxford, Not quite Oxford, Reigate, MAWS, Gloucester, Wessex & Solent. Hopefully we will have enough interest to make at least 8 teams - I'm not sure I have a team yet so interest from individuals also welcome. Maybe we could even get to 10 teams? I would like to collect entry fees at or before Britcon so please bring extra cash! Thanks Jon - I'll keep you posted. It is nice to see that the second string team for Oxford is in fact the "Oxford" team with David and Lynda part of the "Not quite Oxford" Team. The "Oxford" Team is Phil Jelly, Peter Card and me. We now have 8 confirmed teams for the weekend - thanks to everyone who has signed up. There was quite a bit of interest at Britcon from others who may wish to join us. We can accommodate 2 more teams. If we have 6 individuals who wish to attend and be placed in ad-hoc teams there is still time. We do have to have 6 confirmed though. Please email me at peterdalby1960@gmail.com if you wish to attend by the 31st August. The event will now be known as the Forged in Battle Team Challenge as the team at Forged in Battle have provided some great prizes for us. Saturday - 09.15 to 12.15 13.00 to 16.00 16.30 to 19.30 Sunday 09.15 to 12.15 13.00 to 16.00 - so all games will be 3 hours. Full details are at the top of this post but please remember to get lists to Phil Powell - campaignphil@bhgs.org.uk by Friday 21st September. Last edited by petedalby on Sat Aug 18, 2018 10:32 am, edited 1 time in total. I have been asked to clarify a point on lists. EG Medieval Burmese from Empires of the Dragon may be used in the Elephant theme. If they choose a Thai ally that contingent must be from the new Book 2. Forged in Battle have extended their sponsorship and all players attending this event will receive a 15% off discount voucher! Still room for 2 more teams / 6 individuals but I do need to hear from you by the 31st August. Don't delay - act today!! 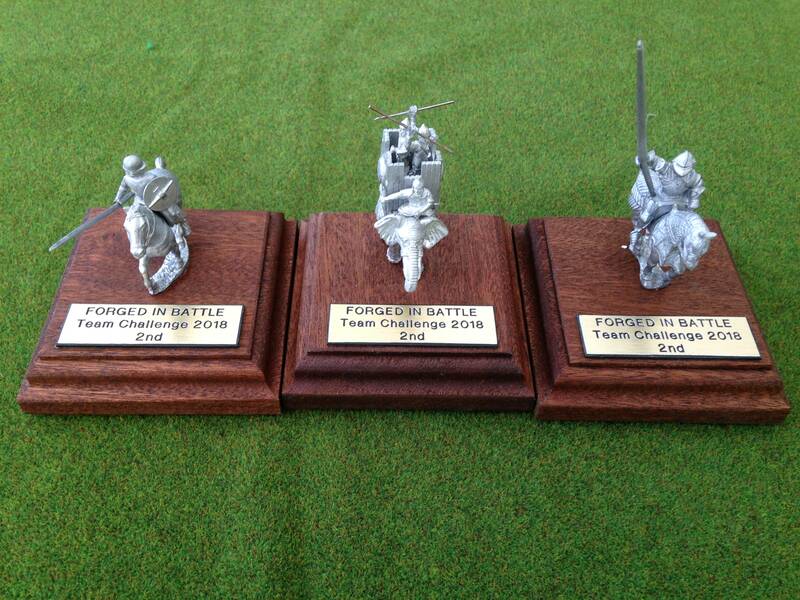 We are unexpectedly a player short for the Forged in Battle Team Challenge event in Sarisbury Green on the 6th & 7th October. If you are available to join in the 'sticks and stones' theme or know someone else who is, we would be delighted to hear from you. First come first served so please come back to me asap. Just finished the trophies for the top 2 teams – see below. All other teams will receive a sample pack of figures from Forged in Battle and everyone taking part will receive a Forged in Battle discount voucher. 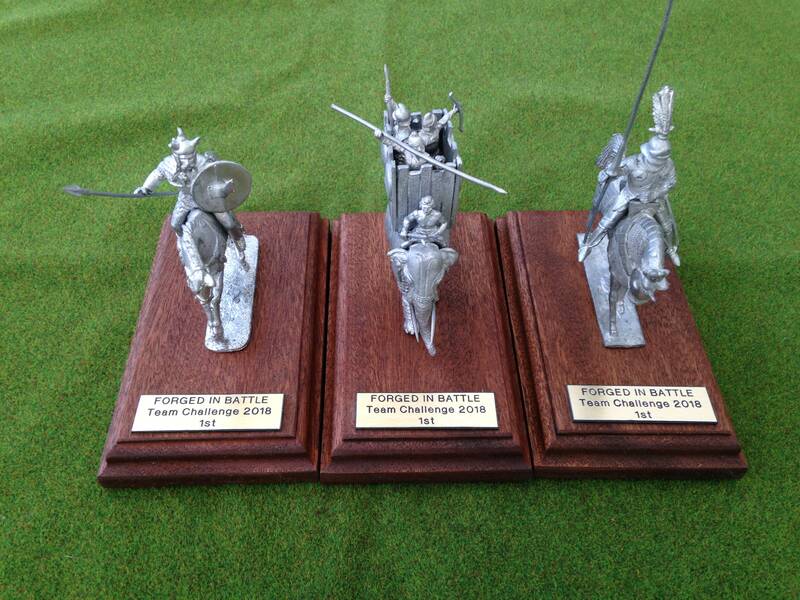 Forged in Battle have also kindly provided a Caesarian Roman Army starter pack. This contains 122 figures and will be randomly allocated to 1 lucky player in true wargaming fashion – we’re going to dice for it! So don’t go rushing off after we’ve finished – if you’re not there you can’t win it! We are still one player short so if you do know of anyone who’d like to join us on the 6th & 7th please let me know asap!